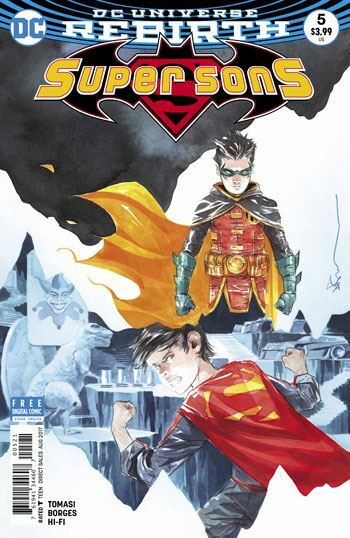 Super Sons 5 is an epilogue, of sorts, to the Kid Amazo story arc that ran in the first four issues of this book. Both Superboy and Robin are in trouble with their parents after taking off in the middle of the night, and now both are grounded. For Jonathan Kent, there is the added torment of his family preparing to move to Metropolis, while he wants to stay in Hamilton. Superboy winds up running off. Well, jumping off. Similarly, Damien is not enjoying being confined to the Batcave, and Alfred is unable to force him to stay. Both boys wind up running into each other, and both blame the other for the trouble they are now in. This is young male bonding at its best. Whiny, self-indulgent, refusing to take responsibility, and taking out ones’ frustrations on a best friend. Not that either would ever admit that they are friends, never mind best friends. Tomasi shows exceptional skill in writing these two characters. Despite their powers and skills, these are two adolescent boys, and the comic feels as real as it possibly could as we watch them fight and argue. It’s all pulled off with very witty dialogue and some great comedic timing. And of course, Alfred gets the line that brings the house down. Of course, this would not work nearly as well if the art did not help carry the tale, and Borges gives a frenzied kinetic feel to the kids as they battle through the Batcave. And, as with Tomasi, one needs to credit the realistic touches that make this all work. 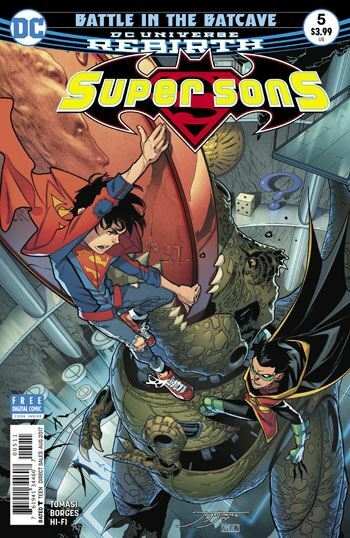 Superboy’s torn jeans and flailing shoe laces help ground the character in reality. This book is so much fun to read it is very easy to ignore how well told it is. That is truly a credit to the creative team.